Happy Ink Day everyone! Today is going to be my first day of going down to the Stampede this year and I’m very excited. I spend more money on candy and deep fried treats than anything else. You would not believe some of the things you can get your hands on. Two years ago I had a hamburger where the bun was replaced by two donuts! It’s the closest I’ve come to being in Heaven. I’ll let you guys know what I end up devouring on Friday. 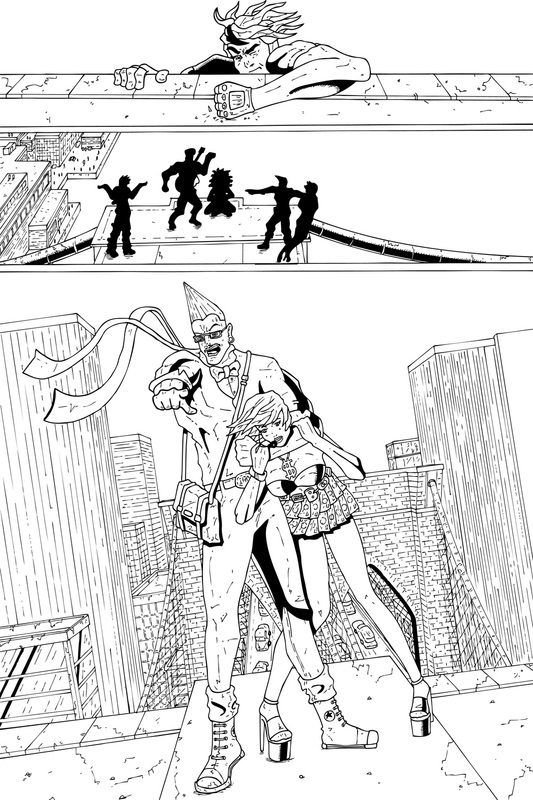 As you could imagine inking a city skyline isn’t the most fun thing in the world but it had t o be done. Anytime I’m doing a scene or doing a background that is more challenging than fun I try to envision what the issue would look like without it and it makes me realize just how vital each panel is. If I had just been lazy and not done a background the scale would’ve been completely lost. I wanted to make sure that a battle on top of the Brooklyn Bridge was as epic as it deserves to be.